We’re all trying to improve the return we get on the time and resources we put into marketing, right? We want the most bang for our buck. Let’s say you’re spending 100 dollars per week on advertising. Your campaigns are doing pretty well and you’re driving 200 people to one of your landing pages. The landing page is currently converting visitors into leads at about 20%, or 40 people per week. What if we could increase that conversion rate to 30? (a 50% jump). You’d suddenly be converting 60 people instead of 40. Each dollar you spent is now returning 50% more than it was. That's the value of optimization. That's how we get the most bang for our buck. This article will dive into call to action testing. I’ll give you 7 real-world call to action examples and show the tests run by businesses like yours that seriously boosted their page conversions, some by more than 400%. Want to keep this article as a resource? Click here to download it as a PDF! The call to action is the point of the sword, the bullet in the rifle, the wheels on the Ferrari. Without it, the rest is pretty damn useless. Your landing page can be optimized to hell and back. Your traffic can be segmented and your offer priceless. Without a call to action button, though, you’re goin’ nowhere. So it’s no wonder that it’s one of the most influential landing page elements you can test. Call to Action Example #1: Does color still matter? Let’s start simple: color tests. Most modern conversion rate optimizers will tell you that color is one of the least-influential optimization factors, and they’d be right. But what about on mobile, where we’re talking about a whole different interaction, available area, and page flow? The color change increased reservations by 7.8% at a 91.7% confidence level. Key Takeaway: Just because something works (or doesn’t) on desktop doesn’t mean the same holds true for mobile. Optimize your site (and landing pages separately, and remember a win or loss in your most recent A/B test may not be transferrable to other platforms. Copy matters, and in this case it mattered to the tune of a 25% conversion increase (at a 95% confidence level). This test was run on paid search traffic for 6 weeks. Version A “Get My Free Paper” resulted in a pretty serious increase over “Download Paper” because the message communicates ownership and personal benefits, instead of just describing what you get. Whenever you can frame your landing page’s offer in terms of your specific visitor, rather than general terms, do it. Call to Action Example #3: Gain? or Just Not Lose? As the name implies, “loss aversion” is the general idea that people don’t like to lose things. It gets interesting, though, when you learn that people are actually more averse to losing something than they are to gaining something of equal value. This call to action test taps into this very powerful psychological factor by adding the copy “You’re going to miss out on GREAT DEALS” as an animated popup which appears when traffic doesn’t click the opt-in checkbox. This change improved conversion on the checkbox by an incredible 473%. Frame your offers in terms of what your prospective customers could miss out on. Frame the expiration of a free trial or deal in terms of what people are losing. For more on loss aversion and 37 other psychological factors which can affect your conversion rates, check out my Complete Guide to Conversion Optimization Psychology. Call to Action Example #4: Does the soft-sell pan out in the long run? It’s possible to push your traffic too hard, too fast. You can intimidate them or come on too strong and they’ll bounce. Equally, it’s possible to be too soft, trying to make it so easy to convert they can’t say no. This can result in your leads not knowing what you want from them, or what they’re really converting on. The soft-sell of “Check Availability” above, came close to doubling this site’s call to action clicks with 96% improvement. Not only that, the site (a vacation-booking company also improved bookings by 13.6% - both at a statistically significant confidence level. You have to be careful with a call to action like this, as the conversion improvement can be a bit deceptive. Soft-commitment can also equal soft final conversions, as the traffic might not be fully qualified or committed before converting. Measure your call to action A/B tests all the way to the end of the funnel. Doing anything else means you’re running the risk of damaging your bottom-line in favor of vanity metrics. The e-commerce company below tested their call to action button in order to increase “add-to-cart” numbers. They had recently come up with an icon which showed the shopping cart icon and a + button (pretty straightforward, right?). 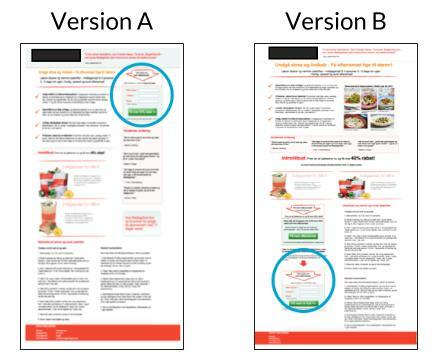 The traditional (Variation 1) CTA design increased clickthrough by 49%. Sometimes innovation is good, and sometimes sticking with what is comfortable, recognizable, and traditional wins the day. In the case study above, the “Add to Cart” copy and design is recognized as the same button used by both Amazon and Shopify. Changing it up confuses site visitors enough to matter. Call to Action Example #6: Does size matter? Bigger should be better right? I mean, the whole point of CTA design is to make it stand out from the rest of the page, right? The larger size actually decreased engagement by 10%. It’s possible that the larger button was as too obvious by the prospective leads. Before they’d received value of any kind they felt put upon to engage, as the large button was the only thing they saw. That said, I hesitate to tell you this test means you should make your buttons bigger or smaller. Rather, I’ll say that this little test shows pretty clearly how much testing matters. Often the things you assume can be wrong, the things you think are wrong can be proven right, and even the things you think you learned from a previous test could be negated by another. Call to Action Example #7: Above or below the fold? Best practices tells us pretty clearly that your CTA needs to be above the fold and ideally on the right side (remember the “F-shape” everybody?). Now, you’ll notice that this was actually a multivariate test (in which many different elements were changed). However, the fact remains that, if we stand by the “CTA must be above the fold” rule, this test should have an obvious winner. And yet Version B increased conversions by 304%. Firstly, never take best practices at face value. Always test them (though they should be your control). Every business, customer, and sales funnel is different. Secondly, the best place for your call to action is not anywhere, except where it “best complements the decision-making process of your prospects" (Cheers, CRO guru Michael Aagaard). ”My general observation, from a wide range of landing page tests, is that there is a correlation between the complexity of the product/offer and the optimal placement of the CTA. If the product/offer is complex, and the prospect has to digest a lot of information in order to make an informed decision, positioning the CTA lower on the page generally works best. And that, my friends, is the science behind call to action optimization. Hopefully this article has given you a bit of guidance on how to optimize your own site’s CTAs. They’re one of the most important landing page elements to test, and you should do so on a regular basis (depending, of course, on how much traffic your pages are seeing). Have any questions about tests we’ve run ourselves, or how you can optimize your own landing pages? Don’t hesitate to reach out in the comment section below.